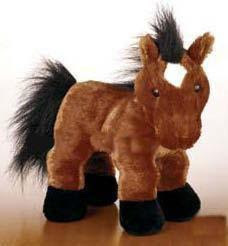 The New Webkinz Brown Arabian is here and brand new to the webkinz family. The arabian horse is known to be one of the oldest known breed of riding horses their is. What incredible energy, intelligence and gentleness this horse has. Arabian horses spend alot of time on the trail, in horse shows, and in other competitive events. Very active and busy horses they are. Because the arabian horse is so smart, head over to Quizzy's with your little buddy to answer some questions to win some kinzcash! What a friend to tag along with. This horse's favorite item is the Horse Shoe Victory Photo. Horse's D'oeuvres is the special food this webkinz loves. What fun you are going to have. The New Webkinz Arabian Horse will be an added treasure to your family. Adopt a webkinz today.